A smooth, hard wearing, durable matt emulsion. Provides a top quality and wipeable finish for interior walls and ceilings. Coverage approx 14m2 per litre. 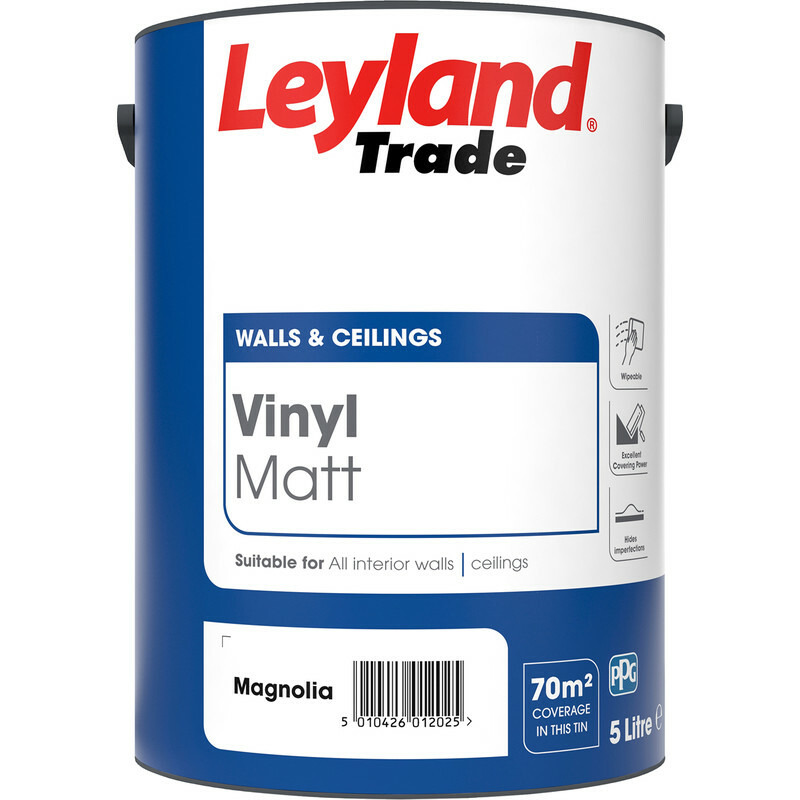 Leyland Trade Vinyl Matt Emulsion Paint 5L Magnolia is rated 4.4 out of 5 by 32. Rated 5 out of 5 by Den17 from Great coverage First time I have painted a ceiling and the result was so good with this paint. Rated 5 out of 5 by NiceDay from Excellent coverage, easy to work with Very pleased with this product, it goes on very easily, minimal drips etc, covers very well. I have ussed the Magnolia in the past and it was also good. Seems to have crept up in price but I would still buy this in preference to say Dulux and would be loathe to consider anything else as they just don't seem to cover properly. Rated 5 out of 5 by alwayslearning3d from Thick paint, easy to apply and no splashes Very easy to roller on. Thick, so sticks to the roller and doesn't splash. Good finish. Rated 4 out of 5 by Ali1 from Good value Needed some white emulsion but was not prepared to spend too much. The Leyland 5l seemed a sensible price and the quality is good. I was able to thin the paint for roller use and the coverage was perfectly satisfactory. Good value and good quality.